Multinational corporations have developed networks of production that stretch across the globe. They have done this in order to maximize their ability to service their customers in markets worldwide, exploit greater opportunities for growth, maximize their profitability and increase their business value. It is the strength and quality of the relationships and connections that we build with other players that will ultimately determine the effectiveness and the success of our business. 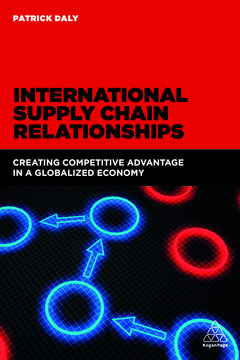 International Supply Chain Relationshipslooks at these complex connections, covering long-term inter-organizational relationships, situational inter-organizational relationships, multi-disciplinary global engineering teams, technologies and innovations, supply chain communication, supply chain coordination, and future trends. International Supply Chain Relationships aims to provide supply chain practitioners in any type of business with ideas, tools and strategies that they can readily access, interpret and put into practice speedily and pragmatically to create value for their own international business. In many instances, supply chain projects bring together people from different disciplines who may come from different cultures and ethnic backgrounds. Add in long distances and different time zones and the complexities and challenges of sustaining successful working relationships increase even more. This book provides case studies which illustrate how to manage these arrangements effectively. Patrick Daly has been a consultant for almost 20 years working in international supply chain and logistics with some of the world's top international corporations, including PepsiCo Worldwide Flavours, Pfizer, Proctor & Gamble, GlaxoSmithKline, Merck Millipore and many more. He has worked with these clients all around the world including China, India, Middle East, Europe, North America and South America.